We will discuss about measuring mass. We know the vegetable seller is weighing potatoes in kilogram. The goldsmith is weighing a ring in grams. The wheat bags are weighing in quintals. 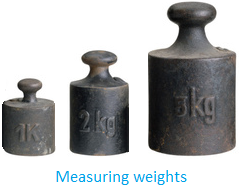 Some of the following weights are used like 10 kg, 5 kg, 2 kg, 1 kg, 500 g, 200 g, 100 g, 50 g etc. The unit of weight is the gram. Kilogram is a bigger unit of weight. We write gram as 'g' and kilogram as 'kg' in short form. Extra questions for sharp students on measuring mass! 1. Find the total weight in kg. 2 kg sugar, 3 kg flour and 1 kg onion. 2. Sam weighs 45 kg and Aaron weighs 56 kg. What is their total weight? 3. John bought 2 kg apples, 4 kg mangoes, 1 kg pears and put them in his bag. Find the total weight of the fruits in his bag. 4. Three brothers weigh 30 kg, 25 kg and 45 kg. Find their total weight. 5. A man weighs 72 kg and his wife weighs 59 kg. How much does the man weigh more than his wife? 6. Papaya sells at $16 per kg. Find the cost of 4 kg of these papayas. 7. A bag of wheat weighs 25 kg. Find the total weight of 8 such bags.